Based out of Bath, UK come Antidotes, a young four-piece who met whilst at school in 2008 and have been honing their tunes ever since. Consistent touring in both Bath and Bristol led to the band recording their debut EP in December of last year. 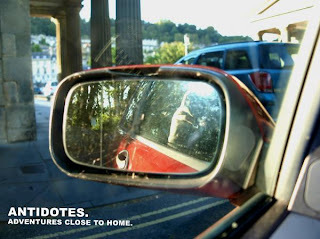 Titled "Adventures Closer To Home" it was recorded at Gatehouse studios in Swindon. Opening track "Football Is A Sport" has intricate guitar picking and off kilter drumming, albeit no vocals, which lulls you into thinking that Antidotes are indeed an instrumental post rock band. However "Advance" quickly removes those thoughts with its fast tempo, and random chants of "Advance" which alongside its strong bassline quite easily gets stuck in your mind. With easily one the best song titles I've come across so far in 2010, "Whatever Happens On The Sofa, Stays On The Sofa", almost comes across as a young Biffy Clyro, with almost spoken vocals, combined chants of "Na Na Na" and Punk drum patterns and guitar riffs. The final track of this short EP is "George, Tell Me About The 80's", and is the bands most expansive track at over 4 minutes long. It is actually the track which shows the clear potential of this band as they combine the individuals traits of the previous songs all in on go, creating a varied tempo, part instrumental, part punk rock track which leaves you wanting much much more than the 12 minute odd record we are treated to. With plenty more gigging in their local area and perhaps further afield, I'm sure in 12 months time I'll looking forward to reviewing a full length album from this exciting and promising young band. Saw these guys at Louisianna in Bristol in December, really, really surprised by how tight their sound was. right on the money - fresh, confident but non of the indie kid cockiness. Strong debut material which promises much, much more. Lyrically witty and musically smart. Good luck Antidotes.